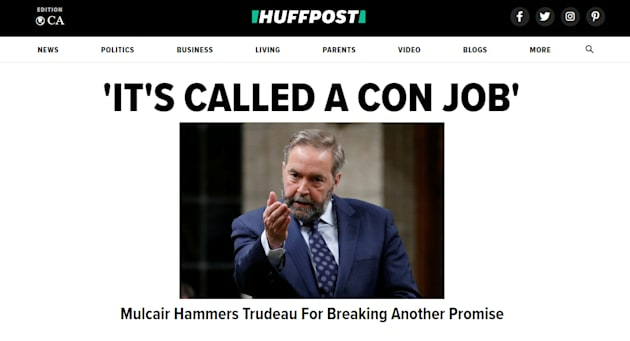 Six years after we launched in Canada, we're proud to bring you a new look and experience at HuffPost Canada. With our redesign, you'll find a cleaner, sleeker look. It'll load faster and we hope it'll make it easy for you to discover more stories on our global network. We have the same great content in news, business, politics as well as our lifestyle and parenting coverage. With the launch of the new site, we have created a new home for our blogs as well as a page to watch all the video we're creating. On our home page, you'll still find blogs, news and video in a slightly different formats and locations, but you'll continue to get the splash headlines at the top of the page. Our navigation is been condensed but we think it's streamlined so you can go to other pages (or one of the other international editions). Our story pages have a wider reading area and we've relocated share buttons for a cleaner experience. We're also introducing a new commenting system. If you have any feedback, feel free to drop us a note.